Crystal Group has entered into a strategic partnership with Ruckus to ruggedize key hardware solutions applicable to industrial and military applications. Crystal Group takes the exceptional product provided by the Ruckus team and adapts this product to perform in harsh environments including vibration, shock, rain, humidity, and temperature. 1. Ruckus Just Redefined “The Edge”: Ruckus provides both wired and wireless networking products. By combining these technologies with one supplier, a cohesive solution is assured while reducing installation time, ensuring compatibility, and enhancing coverage. The result is a better user experience. 2. Port Density and Speed: Ruckus typically offers higher port density and speeds than equivalent competing products, at a lower cost. The performance-per-port numbers are a clear indication of the company’s capability and expertise. Network engineers understand this attribute helps minimize Size, Weight, & Power (SWaP) for programs and applications where real estate and power are expensive. 3. Power Supply Interfaces and Thermal Alerts: Some companies have installed anti-tamper and automated thermal alarm firmware into their architecture, which prevents modification or ruggedization outside of the intended thermal envelope. This limits the performance of the switch under extreme thermal conditions. Using a Ruckus platform as a base allows ruggedization through the use of filtered power supplies (MIL-STD-461) and cooling techniques, enhancing performance in elevated thermal conditions without compromising MTBF. 4. Open Standards & Protocols: Unlike many of its competitors, Ruckus switch architectures do not employ proprietary network protocols and interfaces. Instead, Ruckus products operate within the IEEE constructs and support open protocols. In a multi-vendor network, the use of open standards is the best way to provide the most competitive environment and ensure the network is vendor-agnostic. 5. Common S/W: All Ruckus switch families use the same OS code. Updates are pushed out universally, and the code is more robust because the common image can be more thoroughly tested by Ruckus prior to release. These updates can be automatic under most circumstances, or loaded as permitted by a security manager. They can also be applied in most cases while the switch is still in an operational mode. Ruckus Networks, an ARRIS company, is redefining connectivity around the globe. With our partners, we build secure wired and wireless access networks for organizations that place a premium on connectivity experiences for end-users as well as simplicity and lower-cost-per-connection for IT. 6. Advanced Stacking: Ruckus ICX switches can be connected in a stack for greater scalability, reduced cost, and simpler management. Standard Ethernet ports and cables are used rather than the expensive custom cables that competitors require. This also allows for long distance stacking up to 10km, with a single IP address for remote administration. Furthermore, no special hardware module is required for stacking, and software upgrades can be performed while the stack is in-service. 7. Security: With network security becoming one of the highest priorities, the Ruckus ICX is the only stackable switch to offer hardware-based IPSec encryption. This enables end-to-end encryption from the edge to the core, allowing customers to control network access, support multi-tenant networks, and protect data. 8. SDN Ready: Unlike competing products, all Ruckus products are inherently designed with support for software-defined-networking (SDN) standards, such as OpenFlow. This protects a customer’s investment if a move to SDN is planned in the future. 9. 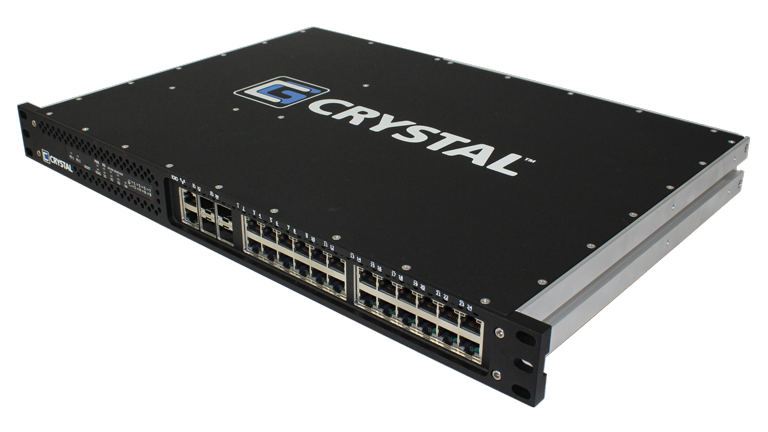 Tier 1 Support from Crystal: Ruckus recognizes that Crystal Group’s business is focused on mission critical and extremely time-sensitive applications. Therefore, Ruckus allows Crystal Group’s Technical Services team to provide front line support to its customers. Ruckus has provided the support team with extensive training, allowing Crystal’s Ruckus Certified Engineers to deliver the 30-minute response time its customers have come to expect. In addition, Crystal will have reach-back to Ruckus Technical Support if necessary. 10. Five Years, No Tears: The standard Ruckus hardware warranty does not apply due to the modifications made to the product. However, Crystal Group replaces that with its own warranty coverage, and extends that coverage to 5 years. Support is only a phone call away.